Changing your baby diapers is one of those things that will make the baby uncomfortable especially when they are a little grown. Babies like to move a lot and keeping them in the same position for long is never going to be an easy thing. 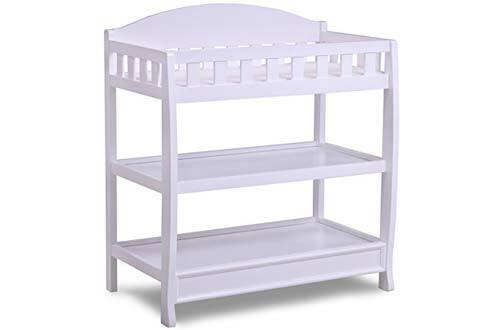 However, having the best baby changing tables that make your baby comfortable for swapping diapers can make it easier for you to deal with the whole process. Not all parents use a table to change their baby diapers. There are those that use changing pads while others use the bed or portable playards. These are great but have a problem with the parent bending way too much. You can buy a changing table that can match your nursery or crib. 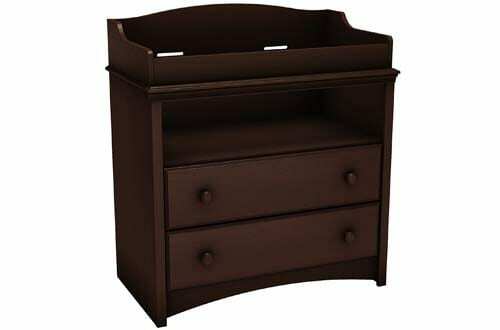 Changing tables are ideal and come with additional storage space and comfortable bending height. 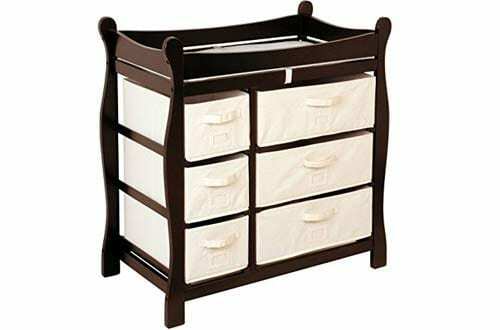 If you’re looking for stylish, affordable and quality baby changing tables, then these are some great choices for you. If you love wooden material products, then the Delta table is a great fit that will look stunningly beautiful in your living room. It is sturdily built and comes with a water-resistant changing pad to ensure water does not leak to the table. There is a strap for safety purposes and two storage shelves. You can be assured your baby will not fall with safety rails along the table. The rails are slated to allow for free flow of air. This is a great table with a non-toxic finish and easy assembly. Those who have used Delta products can agree with me they are a quality pick. 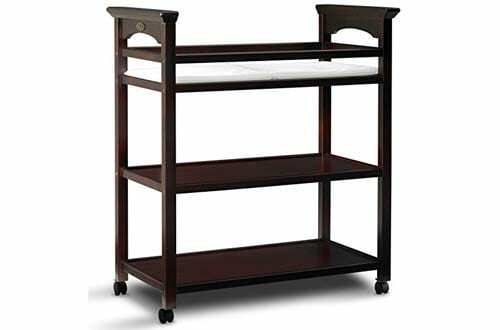 The Eclipse Delta changing table is another quality pick on our list with two shelves, changing pad, safety belt, and safety rails. It is a pretty simple table that can easily be cleaned by wiping with a damp cloth. While some little assembly might be required, buyers can be assured of quality and value for their money. Dream On Me is another perfect baby changing table that will not take you long to assemble. It comes with great directions helping you assemble it in ten minutes or so. The entire pack includes one changing pad and strap. The design is one of the best with buyers choosing from available finishes of Expresso, Cherry, Natural, White and Steel Grey. This is an amazing table that will allow you to change your baby in style and comfort. 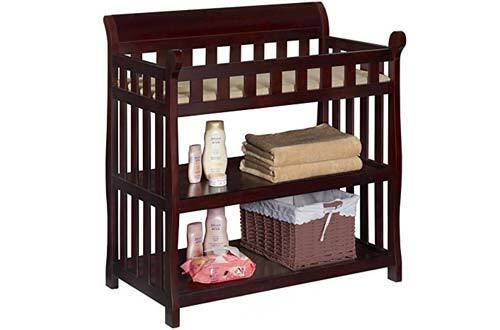 The two open shelves give you enough space to store your baby’s essentials with convenience. 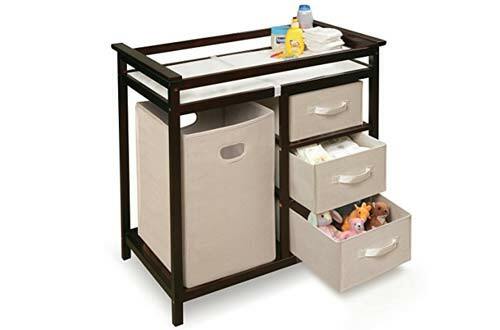 The Badger table comes with six baskets that allow you to organize your baby’s toiletries, diaper, and clothes with ease. It is a classic design table with safety rails that enclose the entire top area. 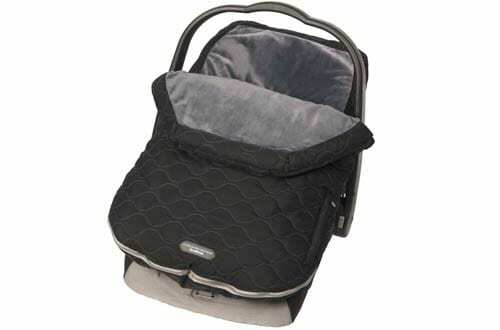 There is a further safety belt, and mattress pad included to enhance the safety of the baby. 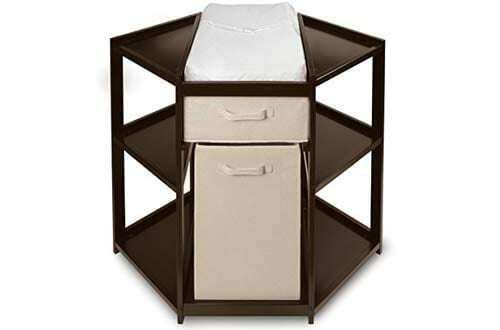 The six baskets can be accessed from either side of the table making organization pretty ease. Parents get to choose the side of the table that faces them. Overall, the quality is exceptional and one that gives buyers good value for their money. 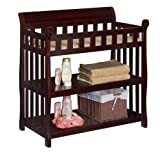 This Badger changing table is made of wooden materials and comes to a sturdy and strong construction that will last. It is a pretty beautiful table with a hamper and three baskets for storage. The baskets are removable and can easily be pulled out for easy. There is a further safety belt and changing pad to make the baby comfortable. Safety rails all around enhance safety. You can easily clean the table by wiping with a damp cloth. 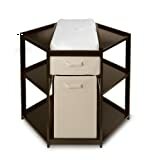 The Graco is an open design changing table with abundant storage space. There are two spacious open shelves to help parents store baby essentials like towels and toiletries. The entire table top is covered by a waterproof vinyl top for durability. Straps are also added for extra security for those worried about the baby falling. Mobility has been greatly improved with four sturdy rollers that ensure you move the table with ease in the house. The construction is solid with the finish non-toxic and durable. 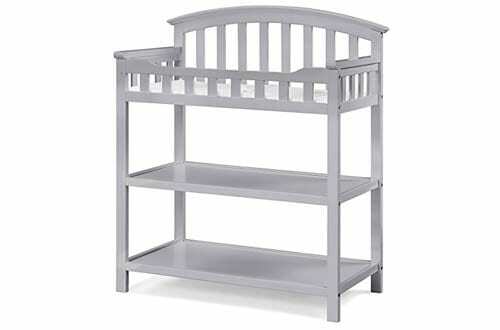 This Pebble grey Graco changing table is another spacious option that will offer you a good value for your money. The table is fitted with a safety strap to hold the baby in place. 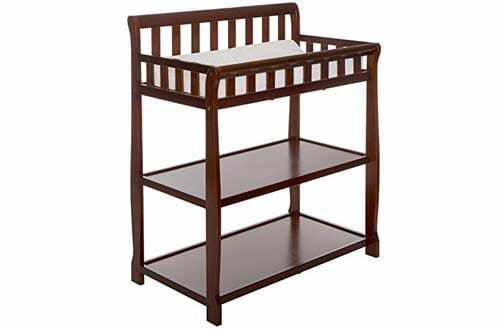 Rails all-around the top area further enhance safety and keep your baby in the changing position. The surface of the top area comes with a water-resistant pad to prevent water leakages to your table. You can be assured of quality and a one-year limited warranty. 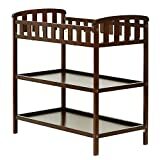 The Ashton Dream On Me is another quality pick for a changing table. It is made of the environmentally friendly New Zealand pine wood. The table finish is safe and has been tested for toxic elements and lead. It is a table that meets and exceeds government requirements for safety. It comes with a water-resistant pad and safety straps to ensure your baby will never fall off. Overall, it is a stable table worth your money and one that will take little time to assemble. 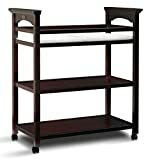 The South Shore is probably the best baby changing table in the market with a plethora of features. The top features rounded contours and a secure front panel for added security. The storage space is not the usual open space but quality drawers that can be pulled with ease. The drawers have handles to make opening and closing easy. South Shore meets and exceeds most safety standards set and comes with a five-year warranty. It is a great design and a worthy pick for your money. 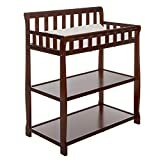 For those looking for a unique design away from the usual rectangular shapes, the Badger basket gives you great baby changing tables in an octagon shape. The table itself is well-priced and nicely constructed giving buyers more for their money. It comes with a hamper, changing pad, storage drawer, and pad cover included. Easily clean it by wiping with a damp cloth. When you compare the table with other expensive options in the market, you will realize it is a bargain and a great value for your money. 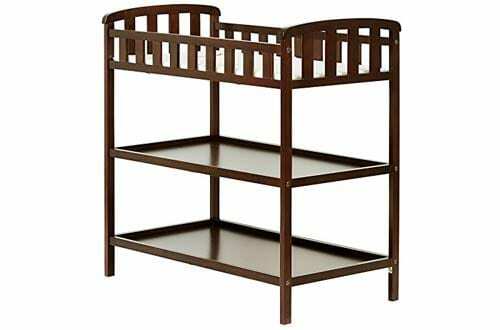 The choices above are the best and buyers can order any that suits their needs with confidence knowing they have a great baby changing table worth their money. These are the best baby changing tables in the market currently and remain highly recommended for their amazing features and great pricing.